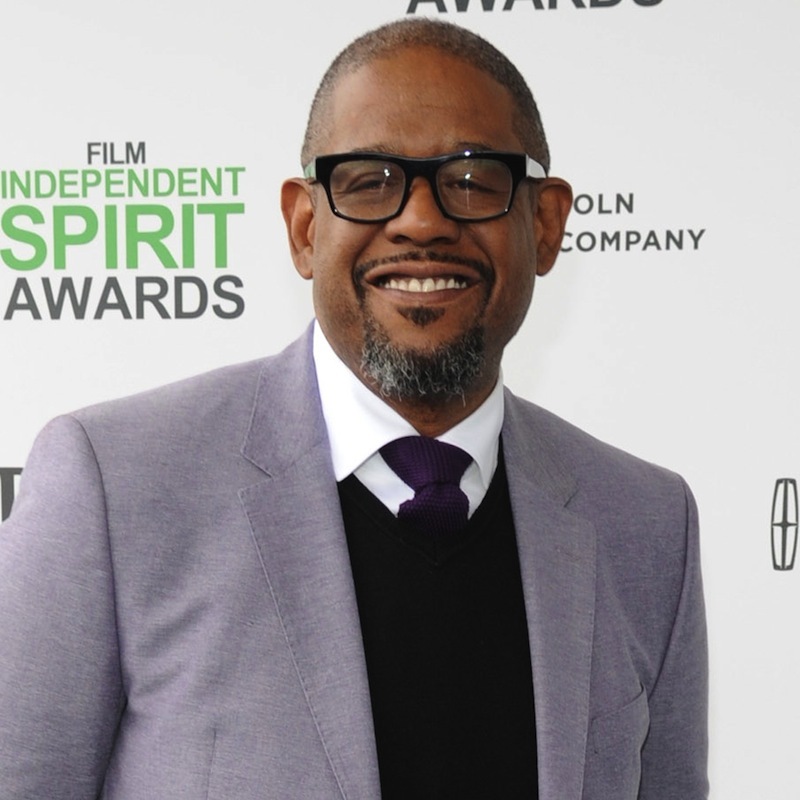 Forest Whitaker is one of Hollywood’s most accomplished actor/director/producers who has showcased his talents in a multitude of demanding and diverse roles. Forest won the Academy Award for Best Actor for Fox Searchlight’s The Last King of Scotland, in which he played the president of Uganda, Idi Amin. In 2003, Whitaker starred opposite Colin Farrell in Joel Schumacher’s Phone Booth for Twentieth Century Fox. He was nominated for an NAACP Image Award for his performance. He received nominations for his performance in Deacons For Defense at both the NAACP Image Awards and the Screen Actors Guild Awards. Whitaker also appeared to critical acclaim opposite Ossie Davis in the Showtime original film Deacons of Defense, a docudrama about a secretive black militia group in the 1960s. Whitaker won an Emmy for producing Door to Door, starring William H. Macy, for TNT under the Spirit Dance banner, the film was nominated for two Golden Globes and was also honored by the American Film Institute. In 2001, Whitaker starred in and executive produced the TV mini-series Feast of All Saints, which won an Emmy and was nominated in two other categories. Whitaker was also the consulting producer and host of the high profile remake of the television series The Twilight Zone, occupying the esteemed position originated by Rod Serling. He produced Chasing Papi, the first major studio romantic comedy aimed squarely at the Hispanic movie going market for FOX 2000 through SDE. Before that he starred in, and executive produced, Green Dragon, which won the Humanitas Award in addition to the Audience Award at the South by Southwest Film Festival. In 1988, Whitaker was named Best Actor at The Cannes Film Festival for his brilliant portrayal of jazz legend Charlie Parker in Clint Eastwood’s Bird, a role for which he also received a Golden Globe nomination. Whitaker earned widespread recognition for his performance as Jody, the hostage British soldier, in Neil Jordan’s Academy Award-winning film The Crying Game. On television, Whitaker garnered a Cable Ace Award nomination for his performance in the Showtime original film, Last Light, directed by Kiefer Sutherland. He also starred in the HBO presentation Criminal Justice, for which he earned a Cable Ace Award nomination, and The Enemy Within, for which Whitaker received a Screen Actor’s Guild nomination. In 2000, Whitaker played the title role of a spiritual gangster in Ghost Dog: The Way of the Samurai, directed by Jim Jarmusch. The film premiered at the 1999 Cannes Festival and screened at the 1999 Toronto Film Festival to critical acclaim. Ghost Dog was nominated for a Film Independent Spirit Award for Best Feature. The film’s soundtrack was a co-venture with Whitaker’s own company Spirit Dance. In 2002, Forest starred in director David Fincher’s film Panic Room for Columbia Pictures, opposite Jodie Foster, Jared Leto, Kristen Stewart and Dwight Yoakam. Whitaker made his feature-film directing debut with the critically acclaimed, box-office hit Waiting to Exhale for Twentieth Century Fox, starring Angela Bassett, Whitney Houston, Lela Rochon and Loretta Devine. He first gained recognition as a director for his debut film, the 1993 HBO original Strapped, for which he received “Best New Director” honors at the Toronto Film Festival. One of his more recent films was the Twentieth Century Fox film Hope Floats, starring Sandra Bullock. He also acted as executive producer on each of these films’ multi-platinum soundtracks that sold over 12 million copies collectively and earned a combined total of 14 Grammy nominations. His short film, John Henry, was released in February 2002 for Black History Month in connection with Disney’s release of Peter Pan’s Never Neverland. Whitaker’s multimedia company, Spirit Dance Entertainment, includes film, television and music production and is both US and UK based. Spirit Dance in London, SD4UK, works with mentoring black and Asian filmmakers. In 2003, Whitaker became Executive Director of the Nodance Film Festival, a festival that celebrates the alternative digital film culture with an emphasis on first-time filmmakers and digital filmmaking. Previously held annually in Park City, Utah, Nodance holds the distinction of being the world’s first DVD-projected film festival. Whitaker’s other credits include Witness Protection for HBO, Light It Up, Touchstone’s Phenomenon opposite John Travolta, Species, Smoke, Robert Altman’s Ready to Wear, Jason’s Lyric, Platoon, Good Morning Vietnam, Consenting Adults, Stakeout, The Color of Money, Johnny Handsome, Downtown, Diary of a Hit Man, Body Snatchers, Vision Quest and Fast Times at Ridgemont High. Whitaker works closely with a number of charitable organizations. He serves as an Honorary Board Member for Penny Lane, an organization that provides assistance to abused teenagers. He is also involved with 4-D All-Stars, a motivational mentor program for teenagers, as well as the Watts Cinema Project. He lives in Los Angeles with his wife and children.